Even better than before, and that is saying something. Grease two 8 x 3 inch cake pans and line with parchment. 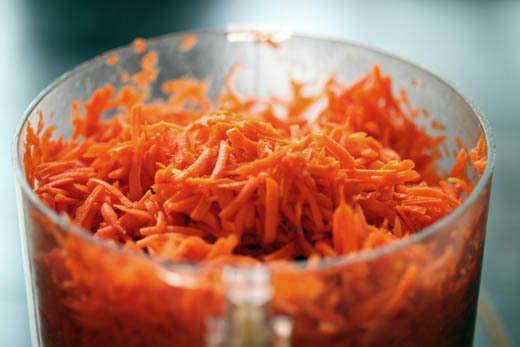 Grate the carrots using the grater attachment on a Food Processor , or a Box Grater (if using the box grater, use the finer side) . 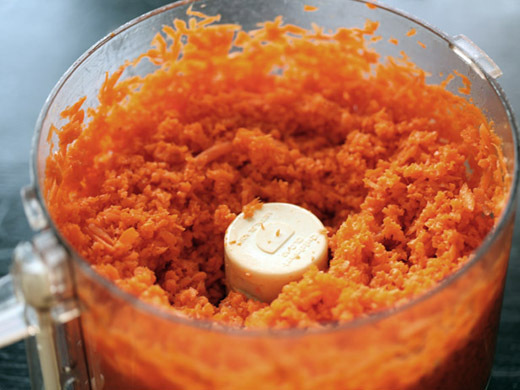 Using the blade on the food processor, chop the carrots more finely. 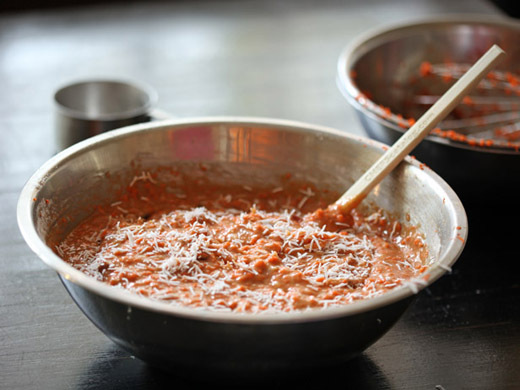 In a small bowl whisk together the flour, baking powder, baking soda and spices. Set aside. In a large bowl, whisk together the sugar, brown sugar, oil, eggs, and vanilla. Then gently whisk in the dry ingredients. 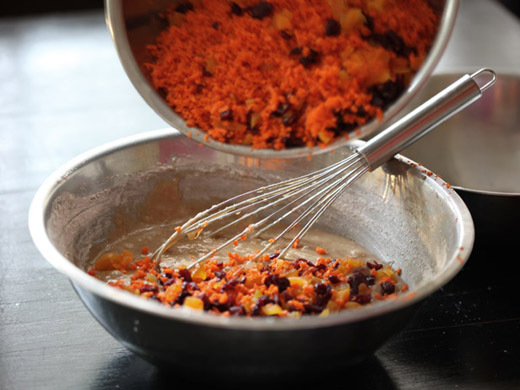 Add the carrots and dried fruit. Divide the batter into the two prepared pans and bake for about 50 minutes, or until a tester comes out clean. 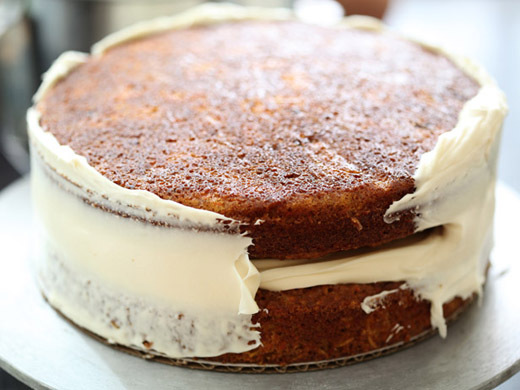 Make the icing by blending the cream cheese, butter, vanilla, lemon extract, lemon juice, confectioners’ sugar and Lyle’s Golden Syrup, until smooth. See my Instagram video for helpful hints on working with cream cheese icing. Put one of the layers of cake on a Wilton 8-Inch Cake Circle, 12-Pack and then top it with 1 cup of the cream cheese icing. Cover the cake with a thin crumb coat (watch video for crumb coat instructions). Then finish with a smooth coating of the cream cheese icing (watch video for smooth icing instructions). I ran my spatula tip around the icing to create the swirls, but we’ll be pressing coconut on the outside, so don’t worry about getting this effect. Use a sharp knife to cut the cake. This cake is wonderful the next day or even the following. Just wrap it well and refrigerate….If there is any left! Absolutely beautiful cake! I love the way you frosted it, so simple yet elegant. It looks like a piece of heaven, Zoe. Seriously, reminds me of a soft, fluffy cloud….begging to be eaten ;). Gorgeous! I love this cake, Zoe!!! Infact, I made it for my brother’s wedding cake. The last time I made it, I added a can of crushed pineapple (I can’t remember exactly what I did, if I cut down on something else, those notes are at home…), but it was AMAZING!!! 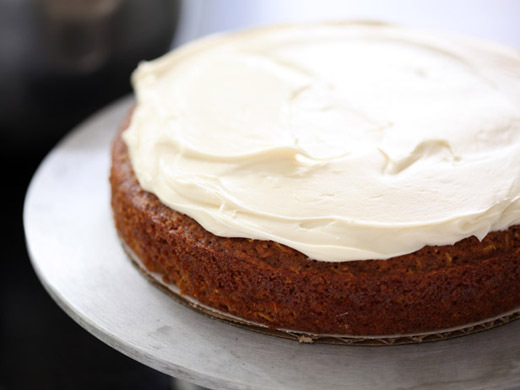 Oh my oh my – this does look like the ultimate carrot cake. Cannot wait to give it a try for myself. Gotta bake this for Thanksgiving…goodness all over, yumm! I think it will be about the same timing, but maybe check it after 20 minutes just to make sure it doesn’t dry out. I used your recipe for the Groom’s cake at my daughter’s wedding. It was wonderful, in fact better than the professionally baked wedding cake. This recipe will definitely have to be used again. This has to be the best carrot cake I have EVER TRIED!!!! soft taste, not so sweet and very moist. Sadly, I’m allergic to coconut. Can that be omitted with success? You can substitute any nuts in place of the coconut, or are nuts an issue all together? This has to be one of my most faves. I love that you use chopped dried apricots and dried cherries vs. raisins. They are delicate, melt-in-the-mouth and complement the carrot texture and taste. YUM!! Hi Zoe: Can this yummie cake be made in a bundt pan and sliced for layers~? Can’t wait for your new book~!!!!!! Happy Days~!!! Yes, you can bake this in a taller cake pan, but you’ll have to adjust the baking time. You can substitute honey. But, if you ever run across Lyle’s you really should give it a try, it is something very special. What a gorgeous take on the classic! I love how elegantly serene it looks. Hi Zoe. Thank you so much for sharing your recipes and tutorial videos!!! They are great!!! I was going to make your Ultimate carrot cake yesterday and was so surprised to see that you posted a revisited recipe. That was so in time for me! So I baked the new cake. Baking part was perfect but I had the problem with the frosting. It became a kind of runny while I was whisking it with mixer. Can it be because I`ve overmixed it? Or maybe I added lemon and vanilla too soon? Could you please explain how to make this creamcheese frosting in details? Your cream cheese and butter may be too soft. If you just refrigerate the icing it should come together and be stiff enough to spread. Let me know if this helps! I’ve raved about your carrot cake recipe to anyone who will listen or taste. I’ll try the new recipe and send my thoughts on the differences. Thanks for all you share with us. hi zoe wat an amazing website u have with lovely cakes and tutorials dat i badly need. i have a question . what is the best way to travel with cakes or cupcakes . i wan to take part in a bake fest in my city where i will display homemade cupcakes. im worried about the icing swirls and frosting melting on the way in the car as its very hot in dubai and i havnt travelled with cakes before. cud u plz help me with this. il really b greatful.. Thanks for visiting the site. When I travel with cakes in my car, especially in heat, I turn on the airconditioning and let the car cool down before loading them in. Make sure they are laying flat and will not move around. You may also need to cover the windows if the sun is coming in. Next time I`ll be more careful not to whisk cream cheese and just blend everything together. Anyway, the cake was absolutely the best ever Carrot Cake! Really Ultimate!!! So delicious!!!! Thank you sooo much for this recipe!!!! Looking forward to chance to bake another your cake! Thank you for the picture, I think your cake looks gorgeous!!! Cream cheese can break, just like cream, so you don’t want to whip it as much as mix it with the paddle attachment, just until it is smooth. I will make the directions a little easier to follow. Thanks for your feedback. This cake looks astonishing!! I just learned though that I have diabetes. It is not a big problem at the moment, but I am trying to eat as healthy as humanly possible. Would it be ok to use sugar substitutes in this cake or would it just ruin everything? Beautifully decorated Zoe. I love a good carrot cake. Thanks for replying! Yes, I can eat walnuts and pecans so I’ll try it substituting walnuts for the coconut. I plan to make your cake. I have a question. Your recipe calls for 1 and 1/4 cup of oil. Can I substitute apple sauce? I also would like to use a can of crushed pineapple, which I have used in all my previous carrot cakes. How does that change the oil cosistency or any other ingredient? Also, should it only be all purpose flour or can it be pastry flour? Sound like great additions, but it will definitely change the recipe and may take some experimenting. Do you want to replace all the oil or just a portion of it? You may want to start with just half? The additional of a can of pineapple, depending on the size of the can will require more flour and eggs or it will just be too wet. Once you have perfected your recipe, let me know, it sounds great and I’m always looking for new ones! Oh, I love this carrot cake, it´s my favorite!!! Thanks for thinking in all carrot cake lovers. What do you use to wrap this cake once it is frosted and sprinkled with coconut. Also, if I use a 8 oz can of pineapple in this recipe, how much additional flour and eggs do you suggest I use. You’ll need to do some experimenting to see how wet the batter ends up. You may also need to up the amount of leavening. When you are changing the recipe this much it takes some work to get it just how you like. I have been playing with this version for a couple of years, tweaking as I go. They were dried sweet cherries. What kind of cherries did you use in this recipe, tart or sweet. I made this amazing cake for a birthday party and it was a huge hit. It was so easy to mix together and it baked up beautifully. The birthday girl is not a fan of cream cheese icing, so I made a brown sugar and cinnamon swiss meringue buttercream instead. I used the cinnamon extract made by Kay Star White (sp?) instead of ground cinnamon, to avoid a gritty taste in the buttercream. I love that cinnamon extract; the taste is reminiscent of the red hot cinnamon candies I liked as a child and it paired beautifully with the carrot cake. I can’t wait to make this cake again! Your cake sounds amazing! Lucky friend! Is it 1 cup of dried apricots and 1 cup of dried cherries or, what, 1/2 cup of each to equal 1 cup total? I changed the wording of the recipe a bit, so I think it should be clearer. This looks very very sweet, do you need all that sugar in addition to the carrots? I’m afraid that along with the fruits and coconut, it will be too sweet. I’ve made carrot cake before with just 1 1/2 cups of sugar and it was just right. I don’t find it too sweet at all, but that may just be my personal tastes. I am not one for overly sweet desserts, but I guess you may have to give it a shot and see if you agree. I love your website and I really appreciate that the baking instructions come with photos. I am planning to bake carrot cupcakes for my son’s birthday but I would like to do it a day ahead. What would you recommend as proper storage — should I wrap them and leave at the counter (room temp) or should I put them in the refrigerator? Also, can I make the cream cheese frosting one day ahead too? Thanks! You can do either, if it is only one day ahead. If you decide to refrigerate them, be sure to leave them out long enough to get to room temperature. Having said that, carrot cake is one of the few cakes I don’t mind eating cold. Most cake HAVE to be room temperature or they are too dense. The icing can be made the day ahead and refrigerated. You may need to put it back in the mixer for a minute or two before using. Thank you very much for your advise. I did the carrot wedding cake. It is just a single tiered cake. It turn out very nice, I think. Come and see it at my blog if you have the time. Give some comments so I can improve in the future. It would mean a lot to me. Thank you. Zoe, my boyfriend thinks the amount of cream cheese reads 2 – 8 ounce not 28 ounces…….is he correct in his assumption? It is 28 ounces, not two 8-ounce packages. Thank you for the recipe Zoe. I have had this bookmarked for a while and I finally resisted the urge of making an indulgent cake for no reason. I frosted it this morning and had for breakfast with a shot of espresso. No New Year diet here. Now I find that you have yet another marvel of a carrot cake…just as I was set to make your first ultimate version!…I noticed that there seems to be more frosting on the cake in the first version, yet there appears as if there are more ingredients/quantities in the second version…am I mistaken? Is this version’s frosting denser…with the first version’s being “softer”?…Lyle’s Golden Syrup is easily found here in France…does this improve the texture in your opinion…which I highly respect and value?…Thank you for sharing your vast culinary prowess! The consistency of the two are similar, but this frosting recipe is a bit easier to use because it is a little bit thicker. -What about sheer quantity? ?….Creamy factor?…Promise..this is my last query…on the question of your duo of truly “Ultimate Cheesecakes”! !..Have wonderful day. I live in France and I would like to try making this carrot cake. We have dessicated coconut here but it doesn’t look similar to the ones you’ve used in your picture. The dessicated coconut have shorter strands of coconut. So my question – is dessicated coconut the same thing as unsweetened shredded coconut ? Merci for you help …. à bientôt ! The coconut I used in these photos is sweetened coconut, which has more moisture than the desiccated coconut. Another reader from France just asked me this very question and we determined that she could reconstitute the dry coconut by tossing it with simple syrup and allowing it to sit overnight. I haven’t heard back to know if it worked for her, but I think it would work nicely. To answer your question, unsweetened coconut here is similar to your desiccated coconut. It works fine in the cake, but if you want to top the cake, like I did, you will want to use the softer, sweetened version. Sorry that I missed the comment from the previous French reader, that you had to re-explain everything again! It’s ashame we can’t get the softer sweetened version here. Yes, I will try to reconstitute the dry coconut to use as toppings for the cake. Not a problem, I was thrilled to see another note from France! I loved this recipe, so much so that I blogged about it. 🙂 I am in awe of the things that you make and your talent, wish I had just a 1/4 of it. The carrot cake wowed my entire family, so delicious. I gave you a shout out here http://www.gigidiaries.com/2012/02/delectable-carrot-cupcakes-who-says-you.html#comment-form Thanks again!! I love carrot cake and am very excited to try this one today! By the way, I adore the picture you use on the top of your blog! You can use honey instead. Have you ever used cake flour instead of all purpose for your cakes? 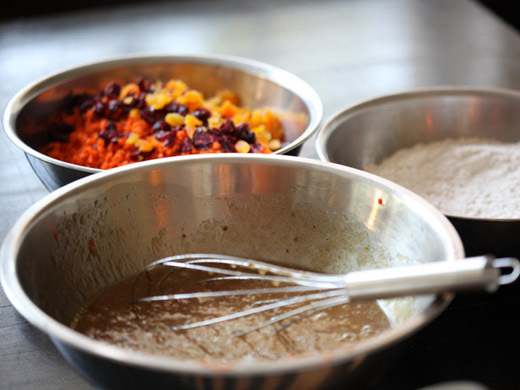 What do you think of the method of making your own cake flour – one cup all purpose flour, minus 2 tablespoons and then add 2 tablespoons of cornstarch = cake flour homemade?? Oh yes, I have done this many, many times and it works like a charm! Came across this in search for high altitude carrot cake. I have tried Pie in the Sky Cookbook and was VERY disappointed. I used a similar recipe to yours, less sugar, more baing powder and soda. The layers sunk in the middle — a typical problem at 5600 ft. I always try a recipe as written first because I have had a number of successes. I LOVE baking but am getting frustrated with cakes at this altitude. Do you think your recipe will work because of the reduction in BP an BS and should I decrease the sugar a bit? Thanks!!!! It seems like it may work just fine, since it isn’t a cake that has too much leavener and is meant to be a bit dense and moist.Having said that, you may want to start with a half recipe and see how it goes. Zoe, why did you change this recipe from three layers to two? Could there actually be such a thing as too much icing? In my opinion there is no such thing as too much cream cheese icing. I would cut this into a dozen layer, just so I could add more icing! 😉 You can cut it into 2 or 3 layers, any more than that and they may get too fragile to layer. thanks for sharing this 🙂 i’ve been trying different versions of carrot cake and this one I will definitely try, hoping to find the ultimate recipe for the elusive carrot cake. anyway, how do i prevent the middle from puffing while baking. it’s always my problem, it’s like a dome at the middle as the cake bakes. thanks! Zoe I made this fabulous cream cheese icing for cupcakes but even refrigerated it’s too thin to hold it’s shape in detailed piping. I’ve added a ton of extra sugar in an effort to thicken it, but to no avail- it’s still going to collapse when it hits room temperature. Any suggestions as to how I can fix this fix this? I have a cupcake making date with my nephew tomorrow and don’t have time to start all over again. 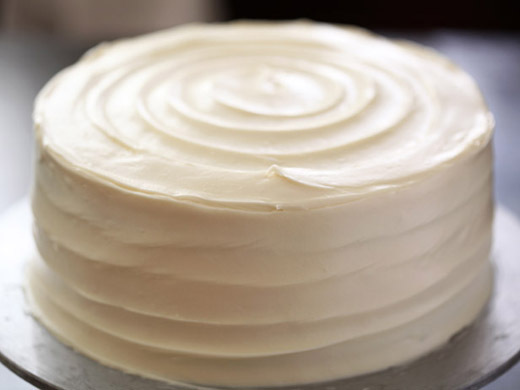 Depending on how soft the icing is, your best bet may be to add some butter to it, which has a bit more structure than the cream cheese and will allow the icing to solidify more quickly, especially when chilled. This, in combination with the sugar you already added, should do the trick. Hi Zoe, If you can’t get Lyle’s syrup can you use something else? You can use honey or just leave it out. I just made the Brioche dough. It turned out a lot wetter than the Master Recipe. Should I add more flour or is that the way its supposed to be? Hello zoe! I just confusing the recipe that I wanna use.. both looks so yumm! u prefer this recipe than before right? I do like this one, but you should give it a try and see if you agree! fabulous tutorials! I needed a stunning carrot cake recipe. By the way, do you have a tutorial to do the swirls… I can never do it right. I don’t want to add the coconut. I don’t have a video for the swirls, but I will try to make one! I never thought making carrot cake was easy. My aunt fusses when she makes carrot cake. I just made this cake, with some alterations because we didn’t have enough ingredients. I replaced a quarter pound of carrots with pineapple, halved the brown sugar, substituted the coconut and dried fruit with pumpkin seeds and raisins. It was a bit damp, I think because of the pineapple juices. But still delicious! I’d reduced a quarter of white sugar too next time, the cake was still a bit sweet. 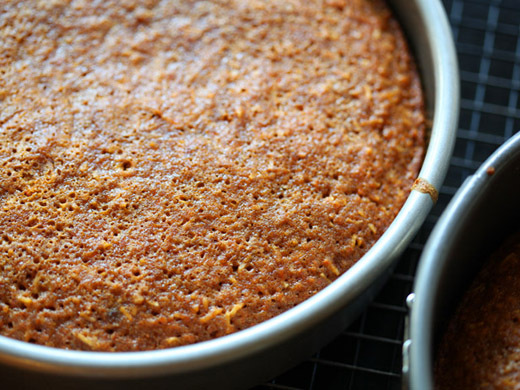 This will be my go-to recipe next time for carrot cake. I’m wondering if I could toast the coconut to put on the top and sides of the cake. I made this for my daughters 1st birthday and I have requests to make it all the time now. Instead of dried fruit I put in crushed pineapple and I also do a little extra cinnamon and no nutmeg….. I am not a fan of nutmeg at all. It was amazing!!! I’m actually making another batch today. Thanks for the recipe!!!! hi i would like to know what happens if i dont use the 4 eggs, how can i replace this , to make this a vegan cake. Zoe, this is the BEST carrot cake ever!! I made it for my mother-in-laws birthday. It was so good, we all had two pieces. I have never seen my mother in law have two servings of dessert. Well done!! Thank you so much, pleased that you enjoyed it! Hi Zoe — I just wanted to tell you that this recipe is beyond amazing. I’m the official family cake baker and no family event can proceed unless I bake this carrot cake. Seriously, I think I would be disowned if I stopped baking it, everyone loves it so much. I’ve been making it since 2012 and have probably made it about 20 – 25 times by now. I have to thank you for this perfect carrot cake recipe! made this for my friends sons first birthday with Vanilla buttercream. it was so good. my husband ate one whole layer without any icing. its absolutely delicous. Finding the perfect carrot cake recipe, I find, just isn’t that easy. This one looks perfect and coming from you I know it must be! This is one perfect carrot cake! Stunningly delicious! This is so beautiful I didn’t think it was carrot cake! However, carrot cake is a favorite of mine and this twist is making me ready to bake it up! I made this cake at the request of my great aunt who wanted a carrot cake. I knew it had to be good and I wanted it to be memorable. I cannot tell you how she and her guests raved about this cake at her birthday party!! It really is just that good- the best we had all ever had! I’m making it again for Christmas. Unbelievable! Thank you, Zoe! Yay, that is so fantastic!!! I am so thrilled your great aunt and you enjoyed it so much!